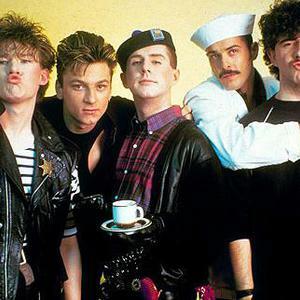 Frankie Goes To Hollywood (FGTH) was one of the most controversial and commercially-successful uk pop acts of the mid 1980s. The liverpool group was fronted by vocalist Holly Johnson, supported by Paul Rutherford (backing vocals), Peter Gill (drums), Mark O'Toole (bass) and Brian Nash (aka Nasher, guitar). The group's debut single "Relax" was famously banned by the BBC and subsequently topped the UK singles chart for five weeks, enjoying prolonged chart success throughout 1984. The group's debut single "Relax" was famously banned by the BBC and subsequently topped the UK singles chart for five weeks, enjoying prolonged chart success throughout 1984. Following the phenomenal follow-up success of "Two Tribes" and the seasonal "The Power Of Love", FGTH became only the second act in the history of the UK charts to reach number one with their first three singles. Things began to unravel in 1985 when their fourth single; 'Welcome To The Pleasuredome' stalled at number two and their second and final album; 'Liverpool' took over a year to complete, reportedly at huge expense. Lead-off single; 'Rage Hard' peaked at number four and it was clear that the public had moved on. 'Liverpool' sold poorly and conflict between lead singer Holly Johnson and the rest of the band led to an acrimonious split. Johnson embarked on an initially successful solo career, but quickly spiralled into obscurity and the rest of the band broke up after several attempts to recruit a new lead singer. Their three number one singles have been extensively remixed and repackaged over the years, and despite their limited back catalogue, the band are generally seen as being one of the defining moments of the eighties. They also had a hit videogame based around them for the ZX Spectrum, Amstrad CPC and Commodore 64.